In 1973, the Southern Railway Terminal was reopened as the Chattanooga Choo-Choo Hotel. This landmark Chattanooga hotel located on Market Street in downtown Chattanooga initially served as the Southern Railway Terminal. Designed by Beaux-Arts-trained architect Donn Barber of New York City, this magnificent architectural gateway to the Deep South opened during the Christmas season of 1909. The new terminal was the centerpiece of a massive urban renewal plan initiated by city officials, real estate developers, and the Southern Railway to redesign the downtown built environment. The railway began construction in 1907 on twenty-three acres centered around the 1400 block of Market Street and demolished the historic Stanton House, a circa 1870 luxury hotel, and numerous dwellings and warehouses to make way for the new terminal and its associated warehouses and railroad yards. Once completed, the Southern Railway Terminal, with its imposing classical styling, symbolized the key role that railroads played in the economic development of Chattanooga. The terminal served passenger travelers until the Louisville and Nashville’s passenger train the Georgian completed its final run on May 1, 1971. 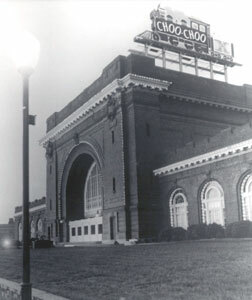 Two years later, in one of the earliest examples of historic preservation rehabilitation in Chattanooga, the terminal was reopened as the Chattanooga Choo-Choo, a complex of hotel rooms, shops, and restaurants designed to attract the patronage of the millions of automobile passengers who passed through Chattanooga via the city’s interstate highways. The hotel’s name derived from the song “The Chattanooga Choo-Choo,” made popular by Glenn Miller during the Big Band era of the mid-twentieth century.